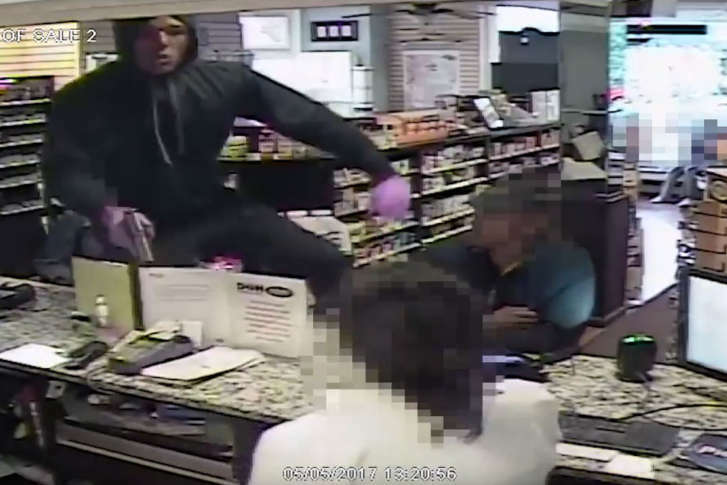 Police in the nation's capital are trying to identify three armed suspects who robbed a Capitol Hill pharmacy in broad daylight. WASHINGTON — Police in D.C. are trying to identify three armed suspects who robbed a Capitol Hill pharmacy in broad daylight. D.C. police released surveillance video from a drugstore in the 300 block of East Capitol Street in Northeast. On May 5, at approximately 2:20 p.m., three young men entered the store and one brandished a handgun. Another suspect stood inside the front door, as a lookout, as the two other suspects vaulted over the pharmacy counter. Employees dropped to the floor as the suspects pulled drugs off shelves and out of drawers, placing the medications in a green bag. The suspects wore sweatshirts with hoods, which they pulled tight to try to obscure their identities. According to police, all three suspects fled in a black, four-door Nissan Altima, with a Maryland temporary tag of T174342. Police ask anyone with information to call 202-727-9099, or submit a tip by text to 50411. A reward of $10,000 is being offered for information that leads to an arrest and conviction.